Professional collection of the most popular type-engine themes and templates of 2015.It is best for personal magazines,business,photography,designs etc. 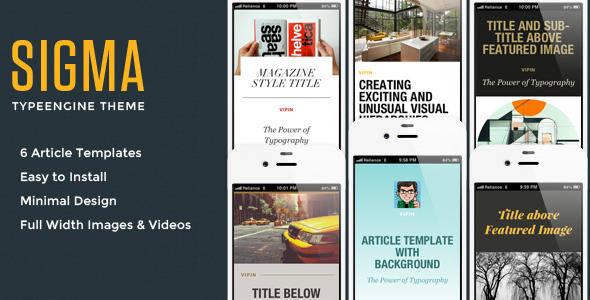 V-Source is a Responsive Multipurpose TypeEngine Theme with 6 stylish article templates. Four templates are designed for the full width landscape (4:3) featured image(1024×768 pixels or greater ). Remaining two are designed for the portrait (3:4) featured image(768×1024 pixels or greater). Theme can be used for personal magazines, photography, fashion, sports and many more. It’s created by using the Foundation offcanvas framework 3 and CSS3 techniques in accordance with the latest TypeEngine Coding Standards. Magbook is a Responsive Multipurpose TypeEngine Theme with 6 stylish article templates. Can be successfully used for corporate magazine themes, personal magazines, photography and many more. It’s created by using the latest HTML5 and CSS3 techniques in accordance with the latest TypeEngine Coding Standards. Fits all iOS devices. Surreal is a clean multipurpose Responsive TypeEngine Theme that includes 6 different article templates. This theme offers a lot of useful features that will help you create awesome articles. Surreal has a fully responsive design that has been tested to work perfect on any device.